Our Real Estate Market moves forward toward summer with prices rising slowly especially in the lower price ranges. 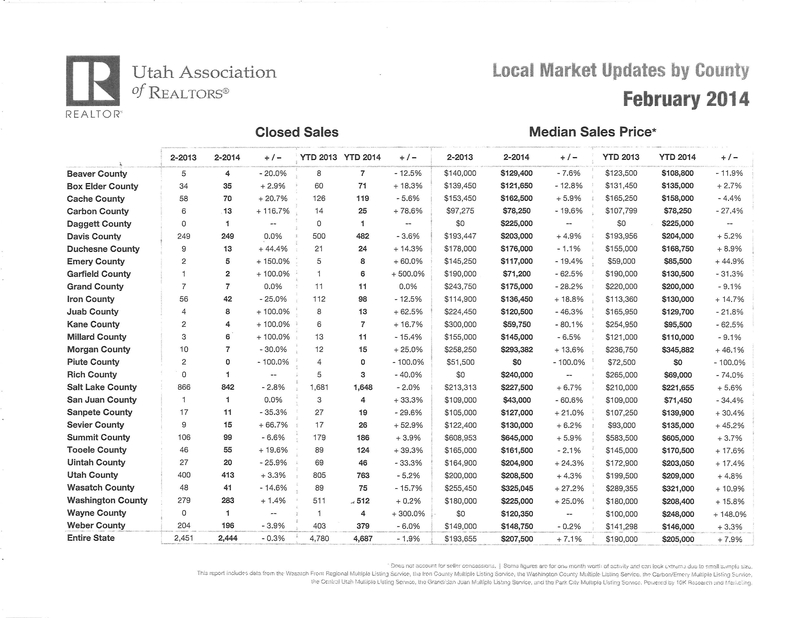 Attached is the latest “Utah Association of Realtors Local Market Updates by County” for all Utah counties. It takes UAR 2 to 3 months to compile this data, so February 2014 is the current data available. Iron County shows a median price of $130,000 which is a 14.7% rise year to date (YTD) as compared to 2013. Experience shows that the rise in market price in our area is taking place in the lower price ranges under $200,000. Iron County shows a 12.5% decline in closings during that same period of time. I believe the decline in closed sales is due to the reduction in inventory. Market priced homes are attracting multiple offers from buyers that want the same home. New construction homes are selling which is good for our real estate market recovery. That is an important addition to our local inventory of homes for sale. Lots are selling at bargain low prices due to the need for the new homes being built to appraise for market value in order to obtain financing for the buyer’s mortgage loan. Commercial real estate is moving but very slowly. It is too soon for the demand for development land to make a come-back due to costs involved–no profit! The Iron County Board of REALTORs (ICBOR) First Quarter Statistics are attached showing sales data from all of the real estate offices in the MLS. There were approximately 738 single family homes on the market in our area at the end of the quarter. 148 homes were under contract. 203 homes closed in 1st quarter according to the report. According to the attached graphs, 190 homes sold under $199,900 by all offices. 71 homes sold above $200,000, so homes are selling in the upper ranges, but not as many. We are pleased that the statistics prove ERA Realty Center is still #1 and that ERA sold most of the homes, which has been the case for many years. Most buyers are still going on line to find the homes they like before they even call a real estate agent. Therefore, our Naisbitt-Bagley Team is marketing on-line all over the nation and worldwide to many sites such as google, trulia, msn, yahoo, zillow just to name a few. Our properties are even on C-21 and Coldwell as well as ERA. We also pay a small fortune for banner ads, features ads, optimized sites and other marketing options online. I do not know of any other agent that markets more aggressively than our Team including real estate magazines and TV and much more. We even pay the Chamber of Commerce to send information on our properties to people who contact the Chamber. Most of the buyers for our area are from out of state, so our global marketing is aggressive. We do have investors in our market as well as buyers moving to larger homes and other buyers downsizing. Please call the Naisbitt-Bagley Team at ERA Realty Center at 435-865-1019 whether buying or selling for your free consultation regarding market pricing, staging, market conditions, concerns, and etc. You can also email naisbitt@inxsnet.com or text Matt at 435-590-8788, Janet at 435-559-7772 or Jennifer Corral at 435-559-0366.